Today was such a fantastic day! 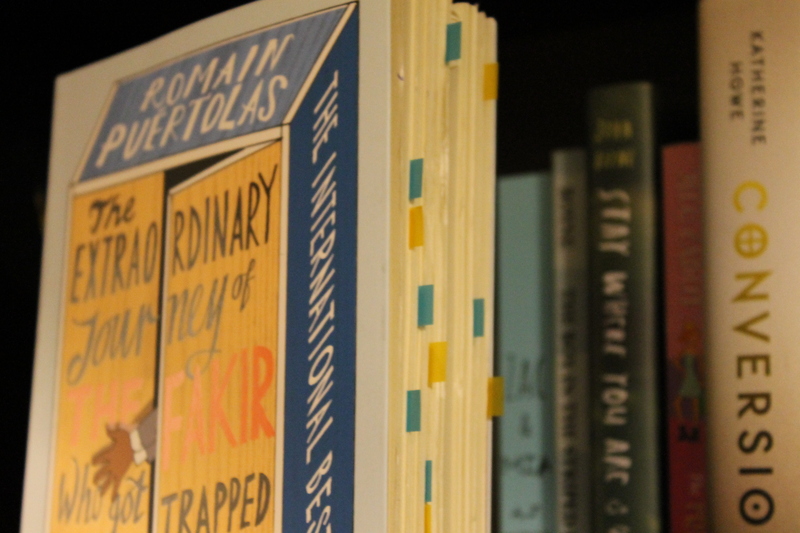 I had the pleasure of meeting and interviewing Romain Puertolas, who is the debut author of the internationally best-selling book The Extraordinary Journey of the Fakir Who Got Trapped in an Ikea Wardrobe (try saying that five times fast). I was very excited (and nervous) to meet him because I really enjoyed reading his book and thinking about the deeper themes that the book touches on. Click here to read the synopsis of the book! KM: So your book is being published in Canada today, congratulations! How has the whole experience been, from writing the book to finding a publisher, and now its success? Has it been difficult, fun…? RP: I’ve been writing since I was 7 years old. I needed to escape from reality and to have another life, another reality, so I wrote these stories. I wrote 7 novels; the Fakir was the 8th one. Each time I finished a manuscript, I sent it to the publisher – just to take a chance – and every time I received a refusal letter. So when I continued writing, I was not expecting to be published. Once I understood that I would never be published, I started printing my novels in 3 copies: one for me and my wife, and two for my two children, so they can have a memory, a remembrance of their father and the stories. (KM: I think this is such a great idea. I love it!) When I received an acceptance letter for the Fakir, I was a bit surprised. It was a handwritten letter from the director of the publishing house telling me that my manuscript stood out of the crowd and that he wanted to meet with me. That was the first surprise. Afterwards we had the big big surprise when we sold the rights to 30 countries before the publication in France. This is the first time this has happened to a debut novel in France. We also had an offer from the cinema to make the movie. It was unbelievable, magical. I translated the book in Spanish for Spain and now I’m co-writing the screenplay for the movie, so that’s another experience. Everyday I think I’m dreaming because I’m traveling all day, all weekend to different countries for the launch of the book and I am well-received in all these countries. It’s very strange for me. I never thought I would be published because it’s something that happens to very few people so I could not believe I could be one of these few people. KM: The Fakir’s journey took you on a journey! KM: So what was the translation process like? Did any names have to change to fit the parenthetical pronunciation guides you give in your book? (eg. We are told that Ajatashatru should be pronounced “A-jar-of-rat-stew” in English.) Did the translations affect the character names at all, or were the translators always able to find something to make it fit? RP: The names had to change to make the puns. I did an annotated version of the novel and wrote notes to the translators because while they have mastered their language and French, they might not be familiar with the slang so I wrote notes. One of these notes was that they had to change the names of the characters; otherwise, you can’t do the 13 puns in your own language. So the translators were free to do so. Some kept the original names. In Italy and Romania, the main character’s name is Ajatashatru Lavash Patel, the same as in the French version, and in the English version his name is Ajatashatru Oghash Rathod. In Spanish I changed the name to Dhjamal Mekhan Dooyeghas. So it’s very different because the point is to do the puns. KM: The parentheses were really fun to read. Why did you decide to add them? RP: At first it was not planned, but when I found the name Ajatashatru online, I said “Wow, that’s quite complicated,” and that’s nice because it’s different. So I took the name and in the word document, I put into brackets “pronounce this way” and afterwards it was a game for me. It’s about the different names we have in the world. Sometimes names are quite complicated for another person to pronounce; it depends on your nationality and your ethnicity. KM: Actually, this is a little embarrassing, but I wouldn’t know how to pronounce your last name. I would have gotten it wrong. RP: You can call me Romain. KM: Okay, I’ll stick to that. *laughs* So obviously IKEA is a huge starting point in the novel. Why start with IKEA? RP: I don’t know. The title came to me. Normally the title comes afterwards but for this novel I had the title one day and I said, “Oh my god, what’s that? What am I gonna do with that?” It was The Fakir Who Got Trapped in an IKEA Wardrobe, because I had an IKEA wardrobe in my room. It was funny to make the contrast between the fakir, who is a classical and traditional figure of Asia, to be in an IKEA wardrobe. 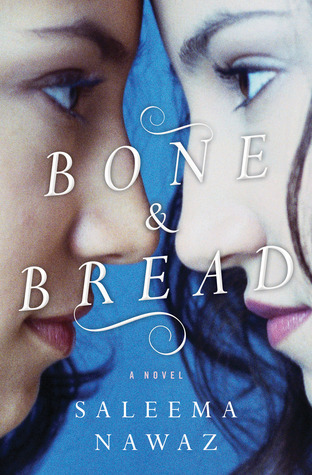 KM: Even though there is that humour and light-heartedness to the novel, it also tells the story of illegal aliens and immigrants trying to provide their family with a better life. I read in your bio that you worked as a police inspector at the French border…? RP: I was working against the illegal immigration networks, the mafias who exploit people who cross the border. The poor people who crossed the border we considered them victims of networks. So I saw a lot of nationalities, and so my fakir is a mixture of them. I don’t like what divides people. We’re all human beings so we should be helping each other and not dividing ourselves. I like when people are united. I didn’t want to criticize, but it’s something I think about the world, my perception of life and happiness and everything. That’s why I put everything in this book. KM: (MILD SPOILER WARNING) While the book ends on a happy note, not everyone gets a happy ending. Why? RP: (MILD SPOILER WARNING) It’s a happy end because I want to tell that in life when you struggle and fight for something you can manage it, you can get it. The journey is very hard for the fakir. He sees a lot of sad things and he’s put here and there, so at the end it’s an award for him, to have a happy ending. But in life there are a lot of people dying, you know? For silly things… A lot of people are traveling in the Mediterranean Sea and a lot are dying, but we don’t talk about that. It happens almost every day. There is happiness and everything but there is something that is a black point that is death and death exists. Always. KM: Let’s end this interview with some short, fun questions. E-books or physical books? RP: I don’t like coffee and I don’t like tea. But I prefer tea – Arabian mint tea. The only tea I like. KM: IKEA meatballs or IKEA cinnamon buns? RP: That’s very hard because I’m a DJ and a writer. It’s impossible to choose. I’m a DJ-writer. KM: Okay, you can choose both. Facebook or Twitter? …And that wraps up my interview! I love that Romain gave such detailed and insightful answers. I hope you enjoyed reading it and I hope you enjoy The Extraordinary Journey of the Fakir Who Got Trapped in an Ikea Wardrobe! 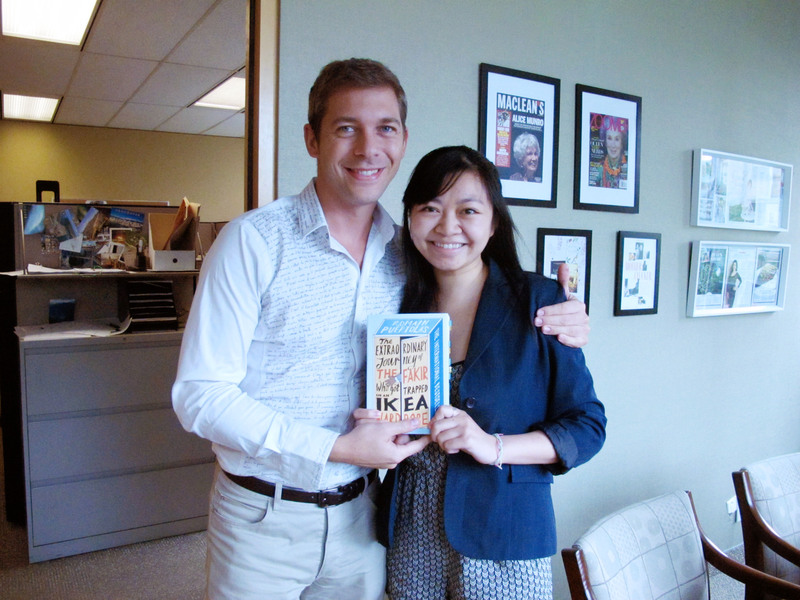 Thank you to Random House of Canada for this great opportunity! 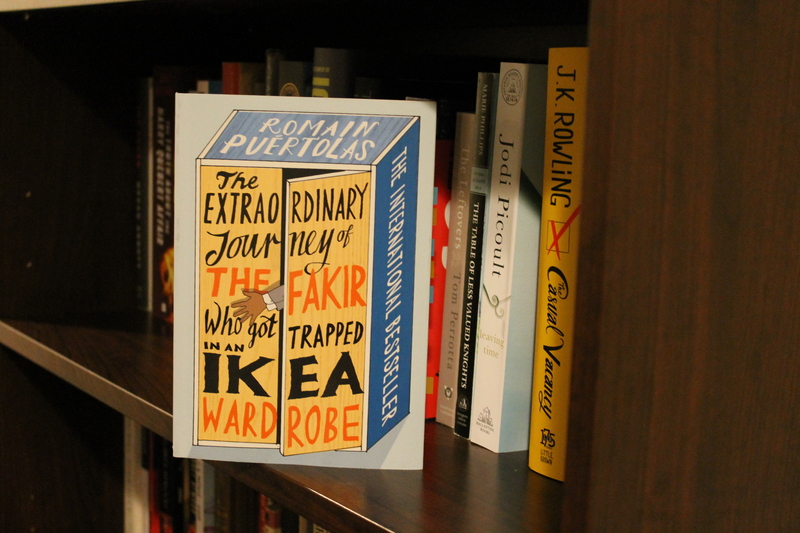 The Extraordinary Journey of the Fakir Who Got Trapped in an Ikea Wardrobe is now available in Canada. Will you be checking it out? Announcement | Book Blogger Brunch! Fun interview! It makes me want to read the book. I love that he just kept writing and sending it in until he finally got his break. I wonder if the titles of his other books are as great as this one? I know! I guess persistence pays off 🙂 Another cool thing is that he wrote most of this novel on his mobile phone aaaand the shirt that he’s wearing in the picture is actually part of a manuscript! (It will make more sense once you read the book.) I thought that was so great. Thanks for commenting, Naomi! So great that you got to interview an author. I can’t wait to read this. It looks really funny. I can’t wait to hear what you think about it! It is definitely a fun, light read with a lot of heart! Great interview, and Fakir sounds like a fantastic book! Thanks, Leah! It was a really fun read!